Energy efficient home builders are making a major impact in the Calgary construction industry. These builders use proven design principles and sustainable building materials to construct homes that conserve resources while offering superior comfort and livability. For homeowners, the end result is a house that saves them a great deal of money, thanks to dramatically reduced energy consumption. Best of all, energy efficient homes don’t cost any more to build than conventional houses, yet tend to have higher resale values. Whole-house energy efficiency systems integrate a wide range of techniques and technologies to reduce heating and cooling loads, cut electricity consumption, and conserve water. In many cases, energy efficient home builders will use computer simulations to test and refine designs, ensuring optimal performance over the long term. At Fine Line Homes, we help our clients live their dreams by creating customized homes that offer superior energy efficiency. We encourage our clients to educate themselves on the principles and techniques we use to save them money while maximizing their comfort. One of the most important considerations that builders make during the planning phase is the orientation of the home relative to the position the sun occupies in the sky at varying times of year. This allows the builders to add windows and skylights at strategic points that maximize sun exposure during the winter and minimize it during the summer. It also facilitates the efficient application of solar power technologies, if you choose to add them to your custom-built home. The home’s layout is also a key consideration. An open-concept layout is recommended, as it allows for the efficient use of space, improves air circulation, and makes it easier to heat and cool the home. Energy efficient home builders will generally place living areas on the South side of the home, and put the home’s utility rooms and bedrooms on the North side. Windows should also be strategically placed and properly proportioned. 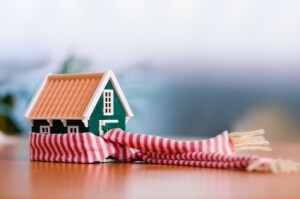 Observing these principles helps energy efficient home builders strike the right balance between allowing sunlight to help warm up the home during the winter while minimizing heat gain during the summer. When it comes to roofing, metal is the material of choice when it comes to energy efficiency. Metal roofs reflect heat, helping keep the home cool during the summer. In addition to lasting for 50 years or more when used as a roofing material, metal is also recyclable. Proper shading also goes a long way towards preventing heat gain during the summer months. In addition to trees, energy efficient home builders use exterior design elements including eaves, awnings, and pergolas to keep the sun off your house in the summertime. However, if you want to install a solar power system on your home, you will have to sacrifice shading elements that prevent sunlight from striking your roof. At Fine Line Homes, we create beautiful custom-built dream homes that offer outstanding energy efficiency and excellent value to residents of the Calgary area. If you’d like to learn more, or if you have any questions about our design techniques or building materials, please contact us.